Kislaya R Mishra did her Schooling from Riverdale, Welham and Brightlands. 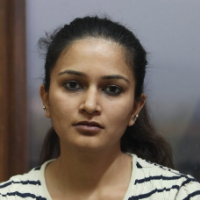 After her Schooling she did her MBBS from Kasturba Medical College, Manipal. She also worked for a couple of years in Lucknow and Delhi. She did her MD in Psychiatry from Stanley Medical College, Chennai. She has been working as a Senior Resident with Shri Mahant Indiresh Hospital since 2016. "I did my Schooling from Riverdale,Welham and Brightlands. After that I did my MBBS from Kasturba Medical College, Manipal. I also worked for a couple of years in Lucknow and Delhi. I did my MD in psychiatry from Stanley Medical College, Chennai. I have been working as a Senior Resident with Shri Mahant Indiresh Hospital since 2016."